Children Turned Caregivers is an educational support group for adult children helping care for parents with Alzheimer’s or Dementia. Have you found yourself devastated by a diagnosis of Alzheimer’s or Dementia in one or both of your parents? Do you struggle with the daily responsibilities, heartaches, and difficulties as you become a caregiver for them? Whether your parent is in an assisted living, nursing home, or home with you, this is a difficult transition. 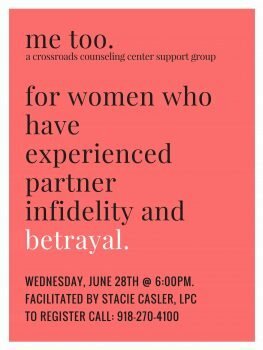 Come to a 6 week support and educational group run by Julie Likins, a Licensed Clinical Social Worker, counselor, and previous medical social worker. As you learn more about your role and how to care for yourself and your parent, you can connect and share your story with others going through something similar. You are not alone or isolated! Starting September 12th and concluding on October 17th. Every Tuesday night from 7:30-9:00. $300 for this 6 week group. Must sign up and pay by 1 week before class starts to reserve spot. No insurance accepted. Minimum of 5 people for group to start. If you would like to attend simply fill out our Make an Appointment Form or call us at (918) 270-4100 and we will reserve your spot.